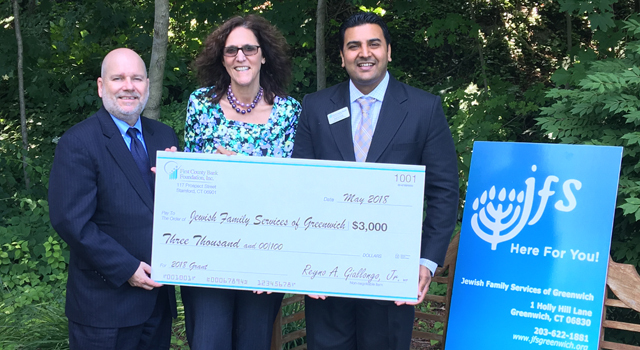 GREENWICH – Jewish Family Services of Greenwich has received a $3,000 grant award from the First County Bank Foundation to help support its Supermarketing for Seniors (SFS) program. SFS is a free grocery shopping program established in 1986 in response to a growing number of frail and elderly Greenwich residents who wanted to continue to live independently in their own homes but were unable to without assistance with their marketing. The only eligibility requirement is that a person be 60 years or older and live in the town of Greenwich. 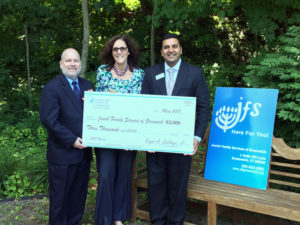 Pictured are Lisa Loraine Smith, JFS executive director, center, accepting the check from Jeffrey Robinson, left, and Jagjiwan Singh, both vice presidents of First County Bank.